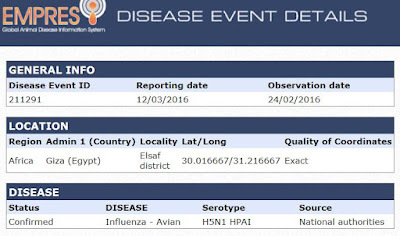 After going 7 months without a reported human H5N1 case in Egypt, for the third time in a week (see previous cases here and here) the FAO is reporting a confirmed case, this time in Giza. 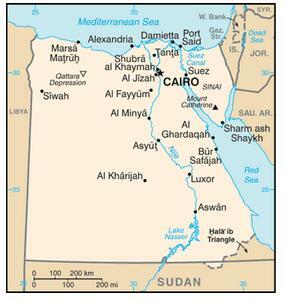 This prolonged absence of reports came after Egypt recorded the largest human outbreak ever, with at least 160 cases (see EID Journal: H5N1 In Egypt) between Nov 2014- May 2015. 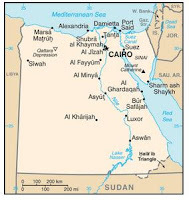 This winter - despite numerous media reports of suspected cases - the Egyptian MOH has maintained the country is free of H5N1 cases (see Egyptian MOH Statement: No Bird Flu Cases Since Last Summer), and has yet to publicly acknowledge any of these three recently reported cases. Today's bare bones FAO report (see below), only provides us with a date and location. As you'll note, the observation date is roughly three weeks ago.